Buddy Merrill joined the Lawrence Welk Show in 1957 and remained with the show until 1977. Lawrence Welk had wanted to add the new sound of Rock and Roll to his show and hired Merrill to play the song "Rock Around the Clock." 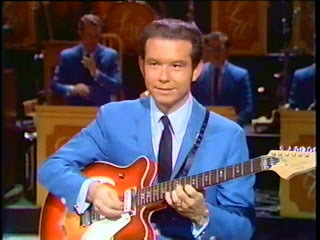 Merrill left the show in 1960 to serve in the military but returned two years later, in 1962. While he was with Welk, Merrill made a number of solo recordings beginning in the sixties and continuing into the 1970's. He was a proficient and versatile guitar player who recorded and performed on both the electric and the steel pedal guitar. He also wrote the musical scores for a number of television commercials. 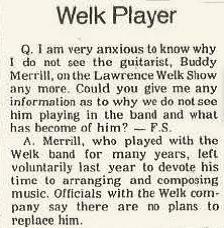 Merrill left the Lawrence Welk Show because he didn't like performing in front of the camera and wanted to concentrate on musical arrangements. After Merrill left Lawrence Welk, he continued to write and compose music and produced several television and radio commercials. He also performed in a Country band based in Los Angeles. In the early 1990's, he began recording as a solo performer again. He released Beyond the Reef in 1992, followed by World of Guitars in 1994.